On November 11th, 1932, in an obituary, the LaGrange Daily News praised the “widely known” Sam Goldstein, “a successful business man and civic leader.” Goldstein and his family fled Russia around the turn of the century to escape conscription in the Czarist military, becoming a respected and valued citizen of LaGrange, Georgia. For many years, his dry goods and shoe business resided in the main town square, marked prominently in a residence known as “the Goldstein building.” For Jews like Goldstein, LaGrange became a welcoming new home and fertile ground to establish a tight-knit community of distinctively Southern Jews. As is evident from Sam Goldstein’s obituary, LaGrange very much shaped the Jewish immigrants who settled in the city and was shaped by them in turn. LaGrange quickly became a wealthy commercial center of Old South Georgia, much of this the product of slavery. The affluence derived from slave labor granted LaGrange many opportunities for social and cultural development. The Troup County Academy for Boys was founded in its early years along with several schools for female education. LaGrange College, established in 1831, remains the oldest private college in Georgia today. The construction of mills and a railroad between Atlanta and LaGrange in the 1830s and 1840s furthered development of the town. By 1860, the community could boast of more than 100 Federal and Greek revival-style mansions, many owned by wealthy planters. Antebellum LaGrange enjoyed an impressive degree of prosperity. By the middle of the 19th century, another group could claim to be contributing to the development of LaGrange: European Jews. Jews, primarily of German descent, settled and established merchant businesses in LaGrange and neighboring towns through the 1850s and onward. These pioneer Jews were generally retailers, such as the Hagedorn, Froshin, Mayer, Freisleben, Heyman, Herzberg and Merz families. Isaac Hagedorn moved to LaGrange and later to nearby West Point, Georgia, establishing the West Point Wholesale Grocery Company with partners. A generation later, Max and John Hagedorn developed the LaGrange Grocery Company, a distributor that remained active into the 1980s. Herman Heyman and Louis Merz settled in LaGrange in 1853. Heyman worked for the firm Behringer and Solomon, while Merz peddled goods, often bought from Behringer and Solomon, in the surrounding countryside. Both shortly after moved to West Point and established the Heyman and Merz retail store. These Jews generally carried over practices of German Reform Judaism, which, along with newly-founded business ties with locals, abetted their assimilation into the LaGrange community. By the eve of the Civil War, many of these German Jews grew an affinity for their adopted homeland, most emphatically demonstrated by their military service for the Confederate cause. While conscription into imperial armies was a major motivation for fleeing Europe, Southern Jews proved loyal soldiers in the Confederate army. Jacob Friesleben, a German-Jewish Confederate veteran and resident of LaGrange, attended many Confederate reunions after the war. ​A glimpse into the life of a Jewish Confederate soldier is provided by the journal of LaGrange resident Louis Merz. Before the Civil War, the LaGrange Reporter stated that, “Young Louis Merz, an Israelite and merchant… was a great favorite among his friends. Brave, chivalrous and patriotic, he had enlisted from a sense of duty.” The Reporter made him a war correspondent, and his dispatches along with his diary reveal his day-to-day life through the war. As in many war mobilizations in history, national conscription proved a cohesive force for Louis Merz, where he routinely ate bacon and either witnessed or partook in all night celebrations involving moonshine. On March 8th and 9th of 1862, Merz witnessed a naval skirmish between the Confederate USS Merrimack and the Union USS Minnesota in what may have been the beginning of the Battle of Hampton Road. Also mentioned in his reports are occasional associations with Jews from LaGrange, such as Jacob Freisleben. Sadly, Louis Merz was never to see his home in west Georgia again; he was killed at the Battle of Antietam, the bloodiest single skirmish in American history. Union Troops destroyed much of LaGrange. Most of the town’s factories were razed, the railroads torn apart, and the infrastructure uprooted. The years following the Civil War required redevelopment in an industrial economic order, rather than one built on slave labor. A generation of entrepreneurs and business leaders rebuilt LaGrange and reclaimed its former wealth. In 1888, the first large scale cotton manufacturer appeared in the town; by 1920 there were nine. LaGrange witnessed its first modern textile mill, a telephone exchange, and a brick production company all by the turn of the century. Much of this industrial energy was channeled by native business leaders, such as Fuller Earle Callaway, who in addition to running business in LaGrange served as a patron of religious, cultural, and humanitarian institutions as well. This new climate of burgeoning commercial activity and modern infrastructural development proved a sufficient motivation in attracting Jews to the region. Leading into the 20th century, LaGrange’s Jews could only superficially be called a “community.” Without a temple or a Jewish cemetery, La Grange Jews sought Jewish life in neighboring West Point, or even as far as Atlanta. However, with the industrial reinvention of LaGrange, the Jewish population also experienced a rebirth. Many of the new Jewish arrivals came from locales other than Germany, including the Russian Empire, the Middle East, and elsewhere. Simon Struletz, born in Byelorussia in 1881, moved to New York City in 1910 before permanently settling in LaGrange shortly afterward. He operated several businesses, such as a retail shoe store and a scrap metal supply company. Struletz was joined by other Jews, such as the Ketzky family of Alabama, the Delancey family of New York, and the above mentioned Goldstein family, all arriving in the years leading into World War I. Many of these new Jewish families also owned their own businesses and were crucial actors in the commercial development of early 20th century LaGrange. Not all of the new arrivals were entrepreneurs. Many provided special services and skills that benefited the LaGrange community. B.J. Meyer, who came in 1915, and Bill Rose were Jewish attorneys in LaGrange. Aaron Goldberg was a pediatrician. These Jews fulfilled vital roles in LaGrange as well as demonstrating the new professional status of many American Jews in the early 20th century. A good representative of this emergent Jewish influx was Harry Edelson. Born in Minsk, Russia in 1898, Harry moved to New York City before arriving in Georgia as a traveling salesman. During World War I, Harry worked as a taxi driver and by 1921, Edelson operated his own ladies’ garment store. Settling in LaGrange, Harry married Sadya Finkelstein, originally from Austria, and raised four children. Harry and two of his sons, Milton and Marvin, became crucial actors in the rise of a thriving Jewish community in LaGrange. The family still owns an Army Store that prominently displays “Edelson’s” on the façade of a building in downtown LaGrange. By World War II, the development of LaGrange and the subsequent growth of the Jewish population had reached a critical mass. Prominent members of the Jewish community transformed their dreams of creating the town’s first synagogue into a palpable reality. By 1940, weekly Friday night services were being held in the homes of the Edelson and Behr families. Throughout World War II, the beginnings of a congregation met in these homes as they prayed for their fellow Jews in Europe and the well being of American troops. The services held in the home of the Behr family prompted a fervent drive to mark the significant Jewish presence in LaGrange with a house of worship. Committees were formed in an effort to make this an actuality; Harry Edelson was appointed head of a group intended to raise funds for the purchase of a synagogue while Harry Behr headed up the effort to find a property. He settled on a former Episcopal Church, located at the intersection of Church and Battle streets, which became LaGrange’s first Jewish synagogue in 1945. 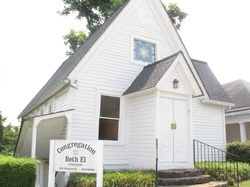 On August 19, 1945, Beth-El formally dedicated their synagogue in a ceremony that drew the participation of several local ministers, including Reverend C.S. Forester, who offered a special prayer for the occasion. The ceremony included the singing of both "The Star Spangled Banner" and the Zionist anthem "Hatikvah." Rabbi Harry Epstein, from Atlanta's Orthodox congregation Ahavath Achim, gave the dedicatory address while Rabbi Eiljah Stampfer of Columbus' Orthodox synagogue gave the invocation. The participation of these Orthodox rabbis indicates that Beth-El was more traditional in orientation. Indeed, many members of the congregation got kosher meat from Atlanta. Beth El's traditional services were often led by Harry Caller, who had studied at a Yeshiva in Europe. Later the congregation would move toward Reform Judaism, though it would never affiliate with the Union of American Hebrew Congregations. LaGrange’s non-Jewish community played a vital role in establishing the temple. Congregation minutes from April 5th, 1945 reveal that Mr. Cason Callaway (Fuller Callaway’s son) offered to pay the difference between the $10,000 raised by the congregants and the $14,500 the building would cost. Such generosity from the non-Jewish community reveals the deep bond that existed between people of different faiths in LaGrange. The benevolence was reciprocated, as in November 1949, congregation minutes reveal the board agreeing to purchase Reverend Forester a going away present because he “was a good friend of the Jews and has done a lot to promote [a] better relationship and good will amongst Jews and non-Jews in the community.” Leading members of Congregation Beth-El often participated in town-wide activities with the LaGrange Ministerial Association, such as a blood drive in 1950 and interfaith celebrations of Passover and Yom Ha-Shoah. Within years of its establishment, Congregation Beth-El became an integral element of religious and cultural life of LaGrange. Even with nearly a century of increasing Jewish presence in LaGrange, Congregation Beth-El was still relatively limited in members and resources. Congregants sacrificed to secure the finances to sustain Jewish life. In 1945, the year the temple was established, the executive committee of the congregation agreed to a minimum $500 fee for initial membership, with the exception of those in the armed forces, and annual dues to be set at $48. At a June 1949 meeting of the congregation, a majority of the members expressed a willingness to pay $250 per year to hire a Hebrew teacher for their children, but they never carried out this plan; instead, boys would travel to Columbus or Atlanta for bar mitzvah training. From year to year, board meetings focused heavily on securing a rabbi for the High Holidays. Efforts were made by members to beautify the temple, with Mr. and Mrs. Jack Moskowitz donating a memorial tablet and Mr. and Mrs. Harry Behr purchasing lighting fixtures for the recreation room. Even with restricted personnel, finances, and hours, Congregation Beth-El successfully sustained Jewish religious and cultural life in the decades following World War II. Congregation Beth-El also initiated impressive outreach and charity work to the broader Jewish community. In 1948, the temple donated to the Jewish Nursing Journal’s drive to rehabilitate Jewish orphans. However, financial obligations appear to have been a recurrent issue for the congregation. Repairs to the old edifice of the synagogue and other costs were often met by individual donations by executive board members. The board eventually decided to sell the building adjoining the synagogue. By 1964, board minutes reveal the costs of running the congregation overran revenue, incurring a deficit of $105 that year. Despite the admirable commitment of the LaGrange Jewish community, Congregation Beth-El has never had a full-time rabbi. While LaGrange has developed substantially since 1945, its Jewish community has experienced a similar pattern to other small towns in the South. Young congregants who grew up in these small towns have moved to large cities that offer better professional opportunities and a greater likelihood of meeting other Jews. According to Milton and Louisa Edelson, one of the few remaining Jewish couples residing in LaGrange, the Jewish community has dwindled from a height of 35 families to currently fewer than ten. Many have moved to Atlanta and other metropolitan areas, including the Edelsons’ children. While the Edelsons drove their children from LaGrange to Columbus, Georgia, to attend religious school every week, most younger Jewish couples have opted to move closer to prominent centers of Jewish life. Congregation Beth-El still has a visiting lay leader come from Atlanta for the High Holidays. The Jewish population of LaGrange is only a fraction of what it was just a few decades ago. Nevertheless, the Jews who grew up, worked, married and settled in LaGrange have very much shaped the character of the town. Marvin and Milton Edelson are respected entrepreneurs and Jewish names are prominently displayed on several buildings in the town square. Milton proudly claims that he suffered almost no anti-Semitism in his lifetime. He became LaGrange’s first bar mitzvah in 1948 and in 2008 he visited Israel to celebrate the nation’s and his bar mitzvah’s 60th anniversary. Growing up, he was a Boy Scout, he played football, and he began a massive collection of Americana that currently overruns his basement. Milton Edelson and the Jewish community of LaGrange are emblematic of the major trends that define 20th century Southern Jewish history.